VYKON Edge Controller 10 is an IP-based field equipment controller powered by the Niagara Framework®. VYKON Edge Controller 10s drive applications such as zone temperature control, and the operation of fan coil units, single-stage air handling units, water-source heat pumps and more. 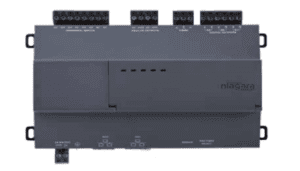 VYKON Edge Controller 10s run the full Niagara stack, with 10 points of on-board IO and IO-R-34 expansion capability. VYKON Edge Controller 10 licensing supports three devices and 50 total points to harness the full power of Niagara at the edge. Contact your VYKON sales representative for additional details. Preorder from VYKON for expected delivery in October to be among the first to receive shipments. Order online today! As always, thank you for your support and partnership. We look forward to what is sure to be one of our most exciting Niagara hardware launches.